Lately I've been getting more and more requests to link to various Web sites. How many of those have I linked to recently? None. As most of us know, the quantity and quality of inbound links has a pretty significant impact on search engine optimization. All other things being equal, if I have 10 inbound links to my site, from places like MIT, The New York Times and Apple and you have 10 inbound links from places like Joe's toothpick collectors blog, I'll be ahead of you in the search engine results pages. So it is no surprise that people strive to attain those links—either by themselves or by hiring SEO firms who specialize in such things. Aside from the SEO value, inbound links also bring in referral traffic from sites that appeal to similar audiences. Assuming you are producing great content—that people find valuable—there are a variety of ways to gain inbound links. Today I'd like to focus on the most basic approach, the direct ask. Link requests are often ignored. Webmasters and bloggers ignore the majority of link requests simply because the requesters don't give us a logical reason to follow through. For example, this request came in a few days ago. "I visited your website and found it to be pretty useful content. I invite you to a link exchange (3-way link*) with our website (s)." This was the extent of the message. The sender didn't include the link to the site, so I had no way of telling whether the site would be useful or not. The person also mentioned that this would be a link exchange. That's a common request, but I'm not going to give away a link just to get a link in return. If I link to a site, I do so only because it has information that I think you, my readers, will find useful. * A 3-way link exchange is a gray/black hat trick meant to disguise a reciprocal link exchange from search engines. Since we only link to relevant sites we need not play such games. Link requests that aren't ignored. Visiting Case was redesigned earlier this year. It no longer includes this page, so I'm showing this screen capture of the old version for reference. When I was Webmaster at Case Western Reserve University I received oodles of link requests because .edu sites are in high demand and we had enough content to appeal to a broad array of topical niches. People wanted me to link to everything from hotels and limousine services to other colleges and "get rich quick" blogs. But every once in awhile someone would suggest a link that was right on target. One such person was the Webmaster for the Greater Cleveland Regional Transit Authority (RTA). 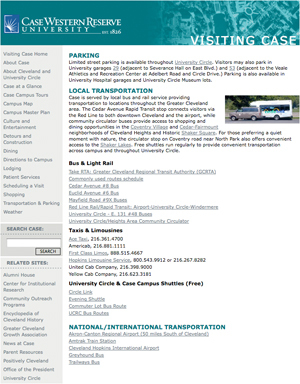 He first contacted me to suggest some additional bus routes I might link to on the transportation page for our Visiting Case site. When he e-mailed me he sent me the recommended links to his site AND sent me the url of the page on my site where he thought the links should go. Knowing that these routes would be of interest to visitors, I immediately added them to the page in question. Over the years he would send me new links as routes were changed so that I was able to easily keep the information current. I really appreciated his efforts because they helped me better serve my audience while also making sure that traffic directed to his site went to the right place. Adding the links was beneficial to all involved. If you don't want your link request to be ignored, then it helps to follow in RTA's footsteps by initiating a link request that benefits both parties. Choosing your victim Targeting sites that could link to you. 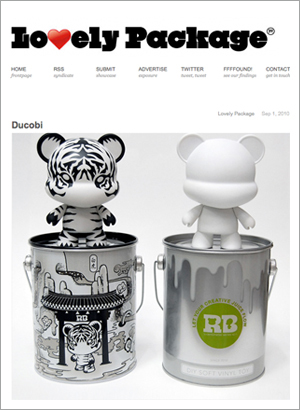 These cool vinyl critters are produced by Ducobi. I haven't done any package design since the late 1990's, but Lovely Package is a great source for design inspiration. Let's pretend that you write a lovely little blog about package design. * If you were to embark on a link-building campaign you would probably start by identifying the top blogs and sites geared towards designers—people who would also be interested in your site. In particular you might look for sites specifically aimed at packaging. After identifying a few plausible candidates such as Package Design Magazine and The dieline package design blog, you should then read through the sites to judge the caliber of the information, and to see if they are drawing in the same sort of readers that you seek. Next you should ask yourself how your site, or a specific page on your site, would benefit their readers. If you can't come up with a clear and specific benefit then you are better off looking for other candidates. If you do have a good benefit then you should also identify a place on their site where it would be logical for them to add your link. If no such place exists, it will be hard for them to fulfill your request. * The folks at Lovely Package have never asked me for a link, nor do they need to. Their site has an Alexa Traffic Rank of 47,211 with 852 inbound links—which means it is already quite popular. Once you've made it this far, asking for the link is relatively simple. The first step is to identify the person at the site who has the power to grant your request. This may be the Webmaster, content manager, an editor or someone else. If they agree with your reasoning then you may very well get that link. If not then at least you'll know you made a sincere effort—rather than spamming them with a nonsensical request. I regularly add links such as these at the end of blog posts for two reasons. 1) They help guide you to additional information on the topic. 2) It helps me show appreciation to sites that provide helpful information. They didn't have to ask, they just produced worthwhile content. Thanks Heidi, This is very useful information, especially the points on following online good manners and giving your link request useful and complete data. I have done this incorrectly in the past and have since mended my ways, but yours is the first article that I have seen to really spell out how to obtain links correctly. Thanks Lallah! I hope this helps you with your marketing endeavors. I chose to write about it mostly because I was getting frustrated by the bad requests I've been getting of late. But my past experience with RTA has shown that link requests can be beneficial to all, it's just a matter of thinking it through, and making sure that we put the needs of our visitors first. Cheers! Thanks Pete, I hope your SEO team finds it helpful. Have a great weekend! I agree with you on acceptance of link requests. I ignore everything unless they're really putting some effort and selling me on some real benefits besides "mutual benefit". I've also had link requests where they include a link to show you how they have already linked to you. 2 things to check for that 1) exclusion of the page linking to you from search engine indexing via robots.txt and a page that includes a query string that shows a specific link in the sidebar depending on the query string. Lots of tricks. Jared, Great tips about the ways they will try to trick you (another reason not to link to someone just for the promise of a link in return.) The tricksters spend so much time looking for shortcuts, and trying to game the system, that it would probably take them less time to just write some decent content that we'd want to link to. Vance, You make an interesting point about being flattered with the first few requests. I think I felt the same way--I suspect many of the link builders do try to appeal to our egos. Yet as you've found if the link isn't relevant there really is no point to it, all they've done is waste our time. My standards are really just a guideline, but I think if people thought more carefully about the links they share, particularly in regard to the needs of our readers, they'd find themselves getting more positive replies. Thanks for your feedback! Hi Heidi, Thanks for your post! I am building up a site by going for quality. Because I think good content is a big problem in many high-ranking sites, I am going to take a quality versus quantity approach and I hope it makes me stand out. For me, making the quality site and putting effort into that is more important than funky SEO tricks and will pay off. Guess I'll see! Great tips about exchanging links. I agree that the links have be beneficial to both sites, most people want to link to any site regardless. I am in the process of starting my own blog and I like what you've done. Thanks for all the advice! This posts sure helps me to understand how to have and create a good linking strategy . Many times i get requests from sites that have no relevant content to my site amazes me. Now i will even be more critical of who links with my site.Thanks.Have a Great Day! It is becoming increasingly harder to find good quality information due to the constant garbage spinning and search result manipulation. But every once in a while you find a rose among the weeds. I think this site and your expertise is just such a rose. I will bookmark your site and make sure it is spread throughout my little network. Link spammers are one of the most hated, below comment spammers, beings in the internet world. I am new to this world and I am greatful for this post, I have learned alot. I wanted to ask for links but did not know how. I guess I don't have that problem now. Great post Thanks. Hi Heidi, As a beginner in Internet marketing I've found that getting links through related sites to be the most time consuming process. It's really difficult to get people to even respond back to me. I spent many hours writing personalized emails to sites that were compatible even offering an article that would benefit their readers. It just didn't seem like the best use of my time. Maybe others have better luck with this. Anyway, I enjoyed reading your post. Many people don't realize the importance of back links. And some of those that do, abuse the privilege. Without contributing anything useful, these guys spam back links all the time; and as a blog or website owner, you have to go thru the effort of cleaning them out. An excellent way of getting back links is still by using article submissions. But make sure that you have something cogent to say; otherwise it's a waste of time. Same with blog posting; you can get some excellent links from related blogs. But you need to contribute something useful to the community for that privilege. The first time I was asked for a link I too was flattered. 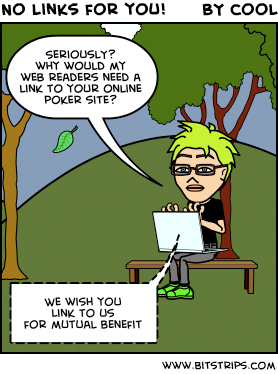 Now not a day goes by without someone asking my for a link to one of my sites. Now I really appreciate when someone takes the time to do a little research about the site they want to link to. It can be a real challenge unless you know the person or it is a really perfect fit. Part of the problem is that we all get so many requests from spammers or those who've not thought things through that we become skeptical of all requests until proven otherwise. That's really what it is all about. If you focus on 1st producing content that readers will find useful, then the links will follow. If you focus on links first it doesn't work out so well. I know what you mean. Many people try to appeal to our egos to get us to use their links, but it doesn't take long to figure out why they're so generous with the flattery. Thanks for the encouragement and for sticking around over the years. I fear I'm rather behind on posts these days, but I'll try to have something up soon. Cheers! Great post. It is a lot of work to get links. You really just need to get out there and socialize with the bloggers. By the way, check out my site at ... just kidding. Great Info Heidi. I get these type of anonymous link exchange request and they are annoying. My theory is just create content that other will find useful and you will naturally get links back to your site. Too may people try to outsmart the system and it doesn't have to be that complicated. Thanks! Great points about linking...cool name by the way! Oops, I mean "great name"
My theme this Christmas has been to re-invent myself as a marketer (which I have been doing since before the fax so it's gonna carry over to New Year's resolution and beyond). What I am taking from this post is that I can use the 'target and ask' strategy to get the quality links you referred to as opposed to the toothpick collector's. Gonna go for the full makeover so I'll be back for more insight & will see you on FB/Twitter. Very good points. I think that relevancy is the major factor to get quality links. I also ignore 99% of link requests but if they come from a great website that is on topic and relevant to my own site and can add value for my visitors I will accept the link. This is the one of the most straight forward inbound link posts I've read in quite awhile. Thanks for sharing your no-nonsense approach Heidi. Much appreciated! Getting building links to a web site is a lot harder than most people think. But i don't agree much with a link exchange or anything like that. If you have good content on home building then more buyers will be interested in what you have to say. Great post. For my local web business I get so many of these. Almost 10 a day and i'd say half are exact examples of what you said above. I also get the " did you realized you are not in the top of google, contact me to get you to number 1 ". They don't even go into details about for what keywords, etc. It's so annoying because you know it's a spam bot just blasting away hoping they get someone to contact them. Good points, I also ignore about 20 link requests a week, I really don't bother looking into most of them since most have a lower page rank and higher alexa then mine and a totally different field. I think its best to seek out websites you want to share with and write them a half decent email, again good points and thanks. Great post! Thank you! I too get several requests for link exchanges often from some off-the-wall, un-related businesses that will do neither of us much good! However, they do make me think! I'm quite new to blogging and find that getting links is very hard work! However, I know that in time, the links will come. It's just hard being patient!!!! All great points. Great content is the key. You should easily start picking up some "natural links" then. yeah, well said, one link from reputable site is better then ten links from junk sites. I still get a lot of reciprocal link request which I would rather avoid. It's all about relevancy and keeping in mind that your link prospect that you are making the request to is listening to WIFM - What's In It For Me.... Show them. Thank for this great Article Heidi. Keep up the great work!